UKIP leader Nigel Farage: "That's a hell of an achievement"
The UK Independence Party has finished second in the European elections, ahead of Labour, on an impressive night for the Eurosceptic party. It performed strongly in the East of England, where it won two seats and its total vote went up, and also picked up seats in Yorkshire and London. It gained 16.5% of the vote and increased its number of MEPs to 13, one more than it achieved in 2004. Its leader Nigel Farage said the result showed its 2004 outcome was "no fluke". And he claimed the party would have gained even more votes if it had been allowed to properly debate the European issue, rather than MPs expenses, which dominated the campaign. Mr Farage said the result was a "coup de grace" for Gordon Brown, who had broken Labour's promise to hold a referendum on the Lisbon Treaty. He said the prime minister had "mocked and derided" UKIP for being a fringe party and, with the result of this election, now must step down. "If we have beaten him, he has got to go," he told BBC News. The BBC's political editor Nick Robinson said UKIP's performance in exceeding its 2004's result - when it polled 16.2% of the vote - was all the more impressive given that it did not have the benefit this time of the publicity generated by Robert Kilroy-Silk. Mr Kilroy-Silk was elected for UKIP in the East Midlands region in 2004 but later quit the party after an internal row. The party's vote fell by 10% in the East Midlands this time around and the party lost one seat. Mr Farage - re-elected as an MEP for the South East region - said the 2009 result was "one hell of an achievement" given that the campaign had been dominated by domestic issues, particularly the expenses scandal. Voters were clearly disillusioned with the three main parties who did not feel they were being represented properly and being given a "chance to have their say", he said. "Last time round we came third," he said. "Everybody said it was a complete fluke, it would never be repeated, and this time we've come second in a major national election." Despite the projected gains, Mr Farage said he was disappointed key issues affecting the European Union such as levels of bureaucracy and waste, immigration and the union's further enlargement had been largely ignored. "We have done what we can to have a conversation with the British public," he said. "What we have not been able to do is to ratchet that up to a big national debate." 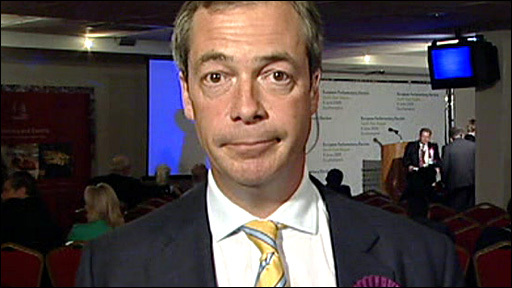 Before the poll, Mr Farage said he would resign if UKIP didn't improve on its 2004 performance. UKIP has threatened to challenge the result of the election after a row over folded ballot papers. Hundreds of people could not find the party's box as it was hidden under a small fold at the bottom of the list of European election candidates, the party said. Mr Farage said the handling of the election was "shameful" and needed to be investigated. The government said returning officers ran elections and an alert had been put out once the problem emerged.